Boris Brott is an internationally recognized Canadian conductor. He holds major posts as music director in Canada. JOIN OUR LIST OF THRILLED CLIENTS. 01. PLAYING TOGETHER WITH BORIS BROTT. Each presentation draws comparisons between business organizations and symphony orchestras — both have common goals. Both orchestras and business organizations strive to achieve the same goals, and both aim for perfection. Both seek innovation and creativity. Boris draws a juxtaposition of teamwork and leadership; the need for creativity within an organization; the joy of communication and the achievement of success. All are explored through the medium of music. During his presentation, these analogies are enhanced with graphics, hi-res video and audio tracks. The audience hears of Beethoven’s struggles, his quest for perfection … hears brief passages from some of Beethoven’s best known works. Boris instructs the audience to reach under their chairs where they will find a tone bar — a xylophone-like musical instrument with a mallet. The audience has been divided into five sections, each section a note. After “rehearsing” and enjoying the levity and excitement, the audience is prepared to play Beethoven’s “Ode to Joy” under Boris’s direction. He turns to the video screen, gives a signal, and a full symphony orchestra begins to play the well-known composition. At the appropriate point, he turns to the audience and “conducts” them in this informative, educational, and fun-filled presentation. Audiences are thrilled to be playing a significant part in an historic piece of musical history, and to make music under the direction of a symphony conductor. Audiences and corporate executives find it a memorable and unique presentation. 02. VARIATIONS OF PLAYING TOGETHER. A live orchestra joins Boris on stage. Musicians and their instruments are introduced until an 11-piece orchestra is formed. The meeting’s host joins Boris in conducting the audience and/or explaining the similarities between their organization and a symphony orchestra. The presentation’s length is suited to the client’s program requirements. Boris can act as host throughout the meeting. 03. COMMON QUESTIONS AND ANSWERS. Click here to view common questions and answers about Boris’s services. Does Boris customize his presentations? Yes, each presentation is customized. Boris has a teleconference with the client prior to the speaking date. During this call, the client expresses the issues, themes, etc., that they want Boris to focus on. Also, they mutually agree on a length for the talk. Does Boris use a live orchestra or audio/video tracks? Most of his presentations include audio/video tracks that are uploaded to the client. If the client has the budget, a 12-piece orchestra can be used instead of the audio tracks he brings with him. The fee for the orchestra depends on the union at the venue. Where do the musicians originate? All the musicians are local and are selected from a symphonic pool of symphony players in the venue. Does Boris require a Teleprompter? Yes, he does. There are multiple cues in his presentations. Having a TelePrompTer makes for a smooth-running presentation while, at the same time, gives Boris the ability to move about the stage. 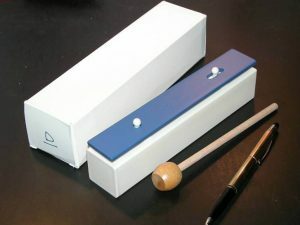 A Tone Bar is a musical instrument that resembles a small xylophone. It’s shipped in a box along with a mallet. The Tone Bars are distributed throughout the audience prior to the presentation. To distribute the Tone Bars—there are five notes—the audience needs to be divided into five sections, each section being a note. To facilitate this delineation, clients send a Plan View of the room where the presentation will take place. Boris will then mark it up and send it back to the client. Who pays for the round-trip shipment of the Tone Bars? Does Boris require a rehearsal? Yes, a one hour technical rehearsal is required. If the client is using a live orchestra, Boris and the orchestra need one hour to rehearse together, preferably in the same room as the presentation. If this is not feasible, then another room in the venue would suffice. Since all live orchestras are hired on a 4-hour call, if the client wishes they can use the orchestra for other elements in the program, i.e. walk-in music, awards presentations. Would Boris do a Q&A? GUEST MOTIVATIONAL SPEAKER AT GLENFIDDICH CORPORATE EVENT. BORIS CONDUCTING A CORPORATE AUDIENCE. RAVE REVIEWS FROM OUR CLIENTS. Boris’s passion for motivational speaking is infectious. Here are some client reviews from recent events. Complete the form below to send an email to Boris’s agent.